Theater Workshop began in 1998 as a self-supporting after-school enrichment program Directed by Stacey April Fix, the program has grown and expanded over the years. In 2011 WORKSHOP ARTS INC. a non-for-profit foundation was formed and Theater Workshop is a program of this foundation. Theater Workshop is dedicated to building a strong creative community celebrating the collaborative work of theater arts across the grades and ages. The mission is to create an enrichment program which is educationally based and emotionally safe for all participants. Theater Workshop builds self confidence and an appreciation for each person’s efforts and offers the highest possible production value in theater arts. 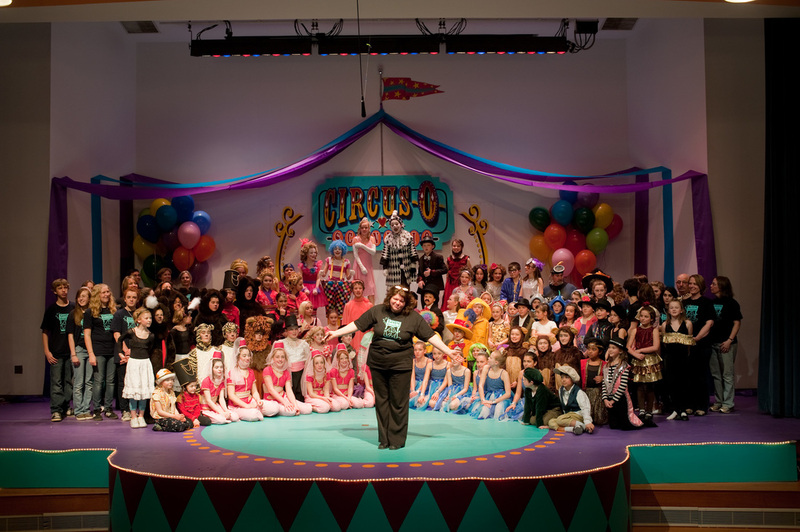 Our high standards are achieved by a professional staff and production process which includes individualized acting instruction, artistic scenery, complete costumes, and application of all kinds of theatrical technical elements. To introduce children and their families to the incomparable magic of theater with a commitment to develop in each child a keen sense of citizenship and self esteem along side their artistic achievements. To create theater that will stimulate and liberate the imagination, intellect, and the spirit for cast and audience. To include all eligible students willing to commit to the rehearsal and performance schedule, volunteer commitment and behavior policy. To create a wide range of parts for all cast members, giving each participant a challenging opportunity for creative self-expression. To integrate all grades together for the rehearsal process and production. To keep registration fees affordable and provide financial aid scholarships. To regard parents as, not incidental, but integral to growth and development of the program. To treat volunteers with respect, dignity and gratitude. To offer students the opportunity for leadership, positive role modeling and learn production support. To provide live theater performances for the community. To elevate, educate, and entertain. To promote theater to the greater community as a process to be explored tested and developed. Introduction to TWS: Introduction to Theater Workshop is a beginner class for 2nd and 3rd graders designed to build a theater vocabulary and comfort on stage. There is no memorization, pressure or performance. This workshop is lots of fun, games and making new friends. There is a peek day on the final day for parents, siblings and friends to come watch some of the Introduction to Theater Workshop activities. Production TWS: Theater Workshop Production is an inclusive after-school theater arts enrichment program self funded by collected registration fees and ticket sales. Directed by Stacey Fix, TWS presents original plays written for the specific cast. Students work together to develop a creative community with individual challenges and mutual goals. There are no auditions or prior theatrical experience required to participate. The program encourages an appreciation for theater arts by building an ensemble based upon theater disciplines such as creative expression through movement, improvisation, character development, stage direction, and sharing an appreciation of other’s efforts while building self-confidence. Financial aid and scholarships are funded by WORKSHOP ARTS INC. and offered to families who require assistance. Free performances are presented during the school day for all NES students. Interns for TWS: This is a Free TWS leadership program for students in grades 7-12. It is a hands on experience in production and technical theater including: lights, sound, props, special effects, scene changes, rehearsal coaching, blocking, under-studying and house management. The hours spent as a TWS Intern can be applied as Community Service credits. Director of Workshop Arts Inc.
Stacey April Fix is the Artistic Director of Workshop Arts Inc. Stacey has lived in Newbury, MA for 27 years with her husband Joe. She has a BFA from Stephens College in Theater and Directing. Stacey lived in NYC for 8 years where she worked at several off Broadway Theater Companies. Other than her main program, Theater Workshop, Stacey has developed many arts programs over the years. One of the programs she founded is Workshop in the Woods at Camp Denison in Georgetown in 2001. In 2015 she retired from the camp program. Stacey has developed a unique approach to community theater. At Theater Workshop there are no auditions and no stage experience is required. Cast members register online and agree to commit to the rehearsal schedule. Families commit to volunteering 5 hours towards the production. Once the cast is assembled then the play is written by Stacey to complement the cast member’s strengths and personality. Original characters are created and the story is written during the process. Stacey has written 38 plays for Theater Workshop casts from 30-105 cast members. The plays are intended to entertain family audiences with the highest production values and professional presentations. The plays feature full scale elaborate sets, custom designed costumes, special effects, choreographed dances and grand finales. Her plays have been performed at the Firehouse Center for the Arts, The First Religious Society of Newburyport, Newbury Elementary School, Stoneridge Montessori School, Page School.